Is it time to move your field service beyond 5 Gallon Buckets? A Lube Skid is a great way to make sure that your equipment is getting the professional PM treatment before you move to a full blown Lube Truck. 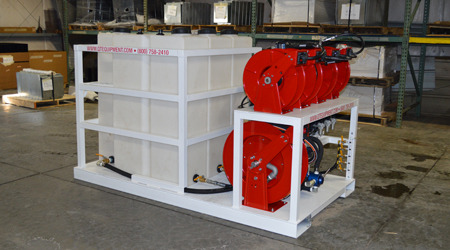 We can modify our standard skid to accommodate a range of product sizes, DEF fluid, add air compressors, and more. Please call for pricing and lead time.